Hi everyone. Just a reminder that we are already over half way through the month. 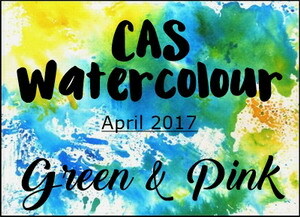 There is just over a week left for the CAS Watercolour April Challenge - Green & Pink. Watercolour Spritz technique was used for the card above. I placed my stamp in the misti, coloured with Stampin' Up! markers, spritzed with water and stamped onto watercolour paper. I reinked the stamp a few times to add more colour ... and used a paint brush to move some of the wet colour around. A simple stamped sentiment and splattering of green ink finishes the card. I hope you'll find time to check out the reminder post on the CAS Watercolour challenge blog. There are more inspirational cards from our wonderful Guest Designer, Marcia ... and the rest of our talented Design Team. LOVE the spritzing, Love the pink and green. Love the card. This is the only water color technique I'm not completely afraid of! :) Love your results, so artsy and pretty! It's so hard to get just the right amount of water with this technique, but you've mastered it, dear friend! So pretty and springlike! Loll, what an outstanding job you've done with this technique. I have rarely got such a crisp image with a wonderful watery look like you do. Love this! It turned out perfectly - just the right amount of water for a watercolour look while still retaining the shape of the image! Beautiful watercoloured technique, Loll for your pretty Bejeweled flowers. TFS and inspiring me to get out my Bejeweled stamp. TFS my friend. Hugs.. This technique makes it look like you watercolored this flower! Lovely! Have tried this technique but without the Misti so being able to go back in with added color sounds like a winner. In your talented hands, it is! Very pretty and soft look...I like the size of the image and the green splatters. So many times I've almost bought this stamp. I love how it looks with this technique, Loll. You may be enabling me again. love this stamp used with the pink and green Loll...so pretty. Just beautiful and perfect for our Spring theme, many thanks for sharing with us at Penny Black and More challenge. Absolutely gorgeous card, Loll! This is such a pretty color combo, and I love that you chose the watercolor spritz technique for this beautiful bloom! I really like the watercolour technique you have used on your image.It gives the flowers a lovely soft look. Thank you for sharing your lovely card with us at Penny Black and More and we hope you will join us next month too. 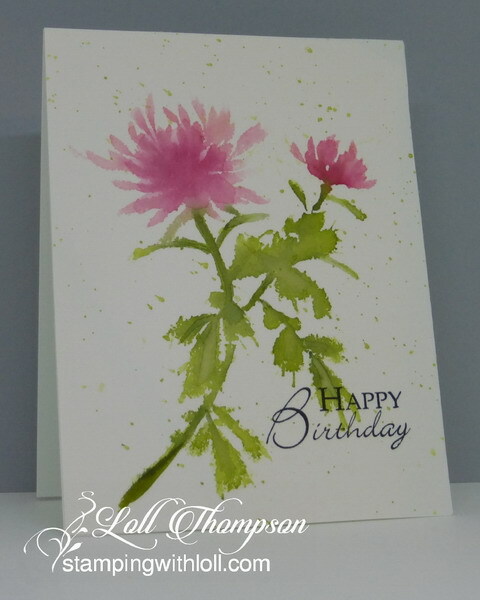 Very pretty card, love the watercolor stamping! What a great watercoloured look, Loll!!! The flowers are sooooooo beautiful and I love the fine paint splatters!!!!! The size, the fonts and the placement of the sentiment is just perfect!!!! Another great card, Loll!!!! Pink & green is one of my favorite color combos & it's so beautiful done in watercolor! I haven't colored & spritzed a stamp in a long time, but you've inspired me, Loll! Thanks for joining us at PBSC!